The shoegaze wunderkinds from Swansea White Noise Sound really turned heads last year with the release of their self-titled debut album, and have since had accolade after accolade rain down upon them from a great height. I took some time out to talk to Adam and Griff from the band. SONIC MASALA - Hey guys. I have to say straight off the bat that the psychedelic, wall of sound ‘shoegaze’ sound is making an almighty resurgence of late – don’t get me wrong, we here at Sonic Masala think this is brilliant – but with so many acts vying for attention, what does White Noise Sound offer that picks them out from the crowd? Adam (vocals/guitar/keyboards/synthesizer/programming/Theremin) – It’s a hypnotic, psychotic cacophony. Griff (guitar/glockenspiel) – Personally, I don’t think our album is a ‘shoegaze’ album. I couldn’t pigeonhole the band or the album into any particular genre – I think that’s how we stand out. SM - What are your thoughts then on the massive focus on this particular sound? Do you feel any particular catalyst has brought this on, or that something else is at play here? Adam – Not sure – ‘Psychedelic’ is a very over-used and loaded term. For us, all of the best music is psychedelic - it takes you somewhere else. Griff – We just make the music that we want to make – I’m sure that’s what most other bands do too… Don’t they? SM - You have brushed shoulders with some of the greats that your sound emulates – The Warlocks, Spacemen 3, Spiritualized – how have these experiences moulded you guys as a band? Griff – We’ve been lucky enough to work with some great people – people we had, and still have, a huge amount of respect for. We’ve learnt a lot from them all… not sure how much detail we can go into though! SM - Your debut LP is garnering some impressive word of mouth. What do you think it is about White Noise Sound that has it making such an impression? Adam – We knew what we wanted to achieve with the record and we’re happy with what we did achieve. Griff – I think the people talking about it and buying it could answer that question a lot better than us. SM - You worked with musical royalty (in my eyes at least) behind the scenes for the album. What was it like locking creative horns with Pete Kember AKA Sonic Boom (Spacemen 3 / Spectrum / E.A.R) and Cian Ciaran (Super Furry Animals)? What did these guys bring individually to the table, and how did this affect you as a band? Griff – We worked with Pete some time back – he’s a legend. The sessions were an experience to say the least… a great experience, but an experience first and foremost! Adam – Cian mixed the album around the time we supported SFA in 2009. He really did take the album to another level and we couldn't have asked for more. SM - As already stated, your band has been, for wont of a better word, ‘pigeonholed’ as a shoegaze act. Is this a deliberate thing for you guys, and does it help or hinder you as a band? Griff – We certainly don’t consciously try and fit any one genre or sound like any one thing that’s been done before. Adam - We do what we want to do – we’re oblivious to whether or not that’s helped or hindered us – what’s the alternative? SM - For those not familiar with the WNS live experience, how would you describe the difference from the record and playing live? Adam – Recording, for us, is about experimenting and getting as close to the perfect realisation of the idea as possible – the approach to the live shows is to push the boundaries to breaking point. Griff – Yeah, recording gives you a lot of freedom to experiment with sounds, but there’s nothing like playing live – loud and in your face. SM - I feel that the ‘usual suspects’ – Suicide, Neu! MVB – would heavily colour your touring playlist, but are there any recent acts or touring buddies that really float your boat sonically? Griff – I don’t think any of us have listened to much music over the last year or so – so we’re all a bit out of touch with ‘new’ music. If people haven’t already, they should check out The Keys, Koolaid Electric Company, El Goodo & The December Sound. SM - What does 2011 have in store for the band – tours/collaborations/film soundtracks/school lunchbox merchandise? Griff – School lunch box merchandise should definitely be top priority – we’ll make a note of that! Adam - We’ve just come back from a tour of Europe and we started work on the second album straight away. We’ll be touring properly again later in the year and there’s some collaboration work being finalised at the moment, so it’s going to be another busy one! SM - And just to tie things off in a raucous lil bow… Its been dismaying to see Iggy Pop swan about in those Swift Cover ads. If you had to succumb to corporate flogging, what product would you endorse, and why? Adam – Tampax. They could use ‘Blood’. Griff – Babybels, maybe? A few of us in the band have been discussing babybels a lot recently. SM - If there was one person that you could punch in the face, who would it be? Adam – That’s the hardest question we’ve been asked to date – there are so many. We’re turning over a new leaf these days though – we’re lovers, not fighters. SM - Finally – what is sonic masala? Griff – Something I’d like to eat. 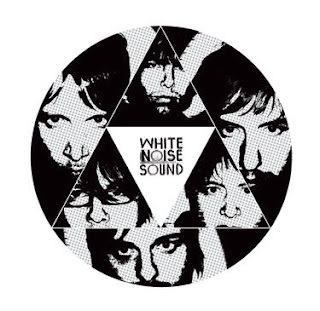 White Noise Sound is out now through Alive Records.